Studied with drummers Jeff Seitz, Charlie Adams and Joe Pace. Teaches basics in rudiments, rhythmic foundations and basic reading skills. 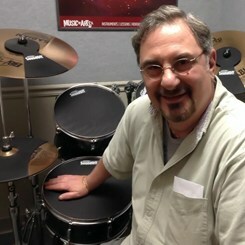 Performance experience includes in-house drummer/percussionist for “ByGosh Studios” where he was responsible for the drum work for major motion picture soundtracks including “Big” and “Mighty Aphrodite”, as well as soundtracks for animated characters featured at Chuck E. Cheese and FAO Swartz Toy Stores.